Welcome to Tigerflicka! Here you find 100% natural skin care products. 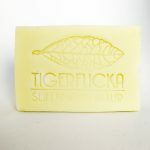 Tigerflicka’s products are handmade in small batches from high quality bio-organic ingredients. All products are completely free from parabens and other preservatives. Mineral oils, silicon oils, and synthetic colors or fragrances are equally banned. Pure and minimalistic products, where each component has its specific function, is the leading star during development of balms and oils. My motto is: 100% natural bio-organic ingredients and 0% junk. I hope you will find what you are looking for here! (Deutsch) Mirakel – die Wundersalbe für sehr trockene, rissige Haut. Mehr über die Mirakelsalbe erfahren.